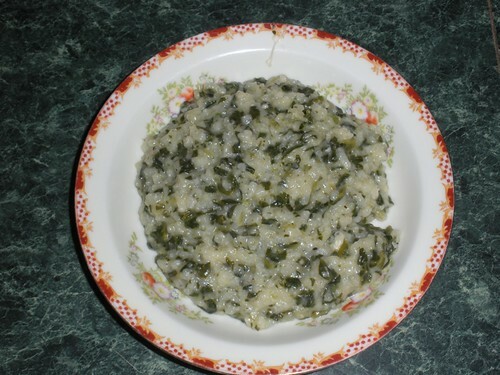 This spinach risotto, in addition to coordinating well with my countertops, is both delicious and easy to make. It’s a variation of this basic recipe for slow cooker risotto. I used less olive oil, though, left out the wine and used a full quart of broth, and added about a half bag of Trader Joe’s frozen chopped spinach. I also used onion powder instead of flakes and two teaspoons of pre-minced garlic. I’m including the recipe below for quick reference, since one of my coworkers wanted to know how I made it. Place rice in slow cooker and mix in oil until rice is coated. Add spinach, all seasonings except salt, and broth. Mix in parmesan (I suggest using a lot) and let sit for 15 minutes. I ate this as a main dish and got about 3 servings. This is a bit low on protein, so you may want to use it as a side dish instead, or add tofu/seitan/tempeh, seafood, or pre-cooked chicken. This recipe also works well with mushrooms, except that I get sick of mushrooms after a while.